A Japanese tombstone company is using the augmented reality technology made popular by Pokemon Go to allow mourners to catch pre-recorded video messages from their deceased loved ones in cemeteries. Named Spot Message, the new Pokemon Go-inspired app is the brainchild of Yoshiyuki Katori, president of Ryoshin Sekizai, a tombstone company based in Katori, Japan’s Chiba prefecture. He claims that the new technology realizes his longtime dream of preserving realistic memories of the dearly departed for the living. My uncle, who ran a paint store, died eight years ago after he fell from a tall structure at work, 33-year-old Katori said. His death was so sudden, and it shattered the lives of his family. I also respected him a lot, so I would often visit his grave, consulting with him in my mind whenever I had issues concerning my business. 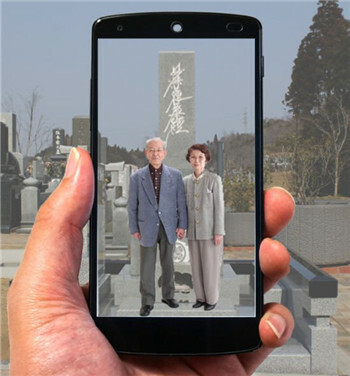 His desire to hear his uncle’s words at his grave inspired the Japanese entrepreneur to use augmented reality to plant pre-recorded messages from the dead at their graves and other places dear to them, for their living friends and family to discover using their smartphones. The Spot Message app is aimed at people looking to leave videos and photos for their loved-ones to discover after they’ve passed away and mixes virtual images with real-life landscapes, just like Pokemon Go. However, Katori adds that his service can also be used for other purposes. For example, a husband can plant a message at the place where he proposed, to be discovered by her on their anniversary, or for mountain climbers to leave congratulatory messages for fellow climbers. Spot Message is free to download, and users can submit up to 10 messages simply by registering. For a larger storage capacity on the company’s cloud servers and up to 30 messages that they can share with up to 200 people, users have to pay a fee. The augmented reality app was launched on Monday for Android, but an iPhone version will also be available in September.